Second of 8 sets of props that will culminate in a rather "messy" birthday cake my characters made for their favorite aunt! 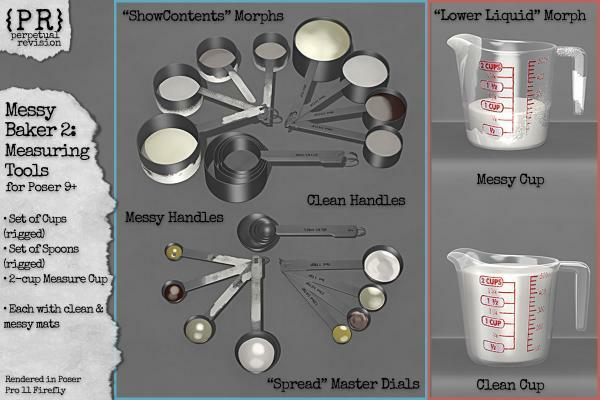 The cups and spoons sets have master parameters on the Body actor for "ShowContents" and "SpreadAll," and you can also adjust each cup or spoon separately. Each cup and spoon rotates around the hole in the handle, so that they stay aligned with the ring. To use a cup or spoon solo, just hide the other actors. Set up in Poser Pro 11 but should work in earlier versions of Poser from 9 and up (although the master parameters may work only in Poser 11). Not tested in DAZ Studio but should work fine with manually-applied shaders. Modeled & mapped in Cheetah3D for Mac. brite72 (5 months ago) Inappropriate? Hi PR! Thank you for creating all these wonderful objects... It's great, very great, to see someone with good ideas! You and TrekkieGrrl seem to be the only ones doing these essential but unglamorous things.